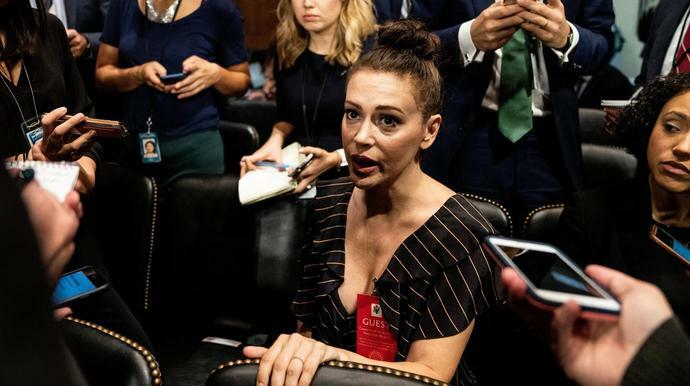 Actress and activist Alyssa Milano has lambasted President Donald Trump and his embattled Supreme Court nominee Brett Kavanaugh as "sexual predators" and symbols of what she described as the "institutionalization of sexual violence" in the U.S. government. In a searing CNN op-ed published Monday, Milano denounced Kavanaugh's bid for a seat on the country's highest court. "We cannot confirm Brett Kavanaugh," she wrote. "We cannot allow another generation of women and children to grow up knowing their government and those acting in its name see us as less than human." The editorial was published just days after the actress attended Kavanaugh's Senate Judiciary Committee hearing on Capitol Hill on Thursday. Milano, who says she was sexually assaulted as a teenager, was pictured sitting behind Kavanaugh carrying a placard with the words "I believe survivors." She later told CNN that she attended the hearing to "stand in solidarity with [Christine Blasey Ford], and all women and men who have been victims of crazy abuses of power." Ford testified before the judiciary committee on Thursday about her alleged sexual assault by Kavanaugh when they were teenagers. "There was a sense of hope in that room, as she spoke, for so many of us that have gone through that," Milano said of Ford's testimony. Milano, who played a central role last year in the ignition of the #MeToo movement, wrote in her op-ed that sexual misconduct and other types of abuse pervade all echelons of the U.S. government. "Both Kavanaugh and Trump have denied allegations against them. I wish so deeply that the alleged sexual violence ― and overall cruelty toward those who are vulnerable ― committed by those who wear the mantle of our nation's government began and ended with these two men. It does not," Milano said. "It exists at every level of our national institutions, and even at agencies working on behalf of our government who are tasked with the sacred duty of caring for children." The actress focused specifically on the plight of migrant children, a record number of whom are currently in U.S. custody. She described how migrant kids were recently moved en masse in the middle of the night, without forewarning, to a desert tent city in Texas. She wrote about the alleged sexual violence, abuse and neglect that some migrant kids in federal custody have endured, including the multiple children who were sexually abused by a youth care worker at an Arizona shelter. She called out Kavanaugh for his dissent of a 2017 appeals court ruling that allowed an undocumented teen to obtain an abortion. If confirmed to the Supreme Court, Kavanaugh "would be making decisions about the bodily rights and autonomy of all Americans," Milano told her readers. Milano suggested the judge's appointment could "further" institutionalize the already prevalent sexual violence in government. "Can we doubt that, if we confirm Brett Kavanaugh to the Supreme Court, this further institutionalization of sexual violence will not rear its ugly head in myriad unseen ways throughout our nation? … In my name? In your name?" "We cannot let Kavanaugh and Trump be the lasting face of who we are as a nation," she concluded.